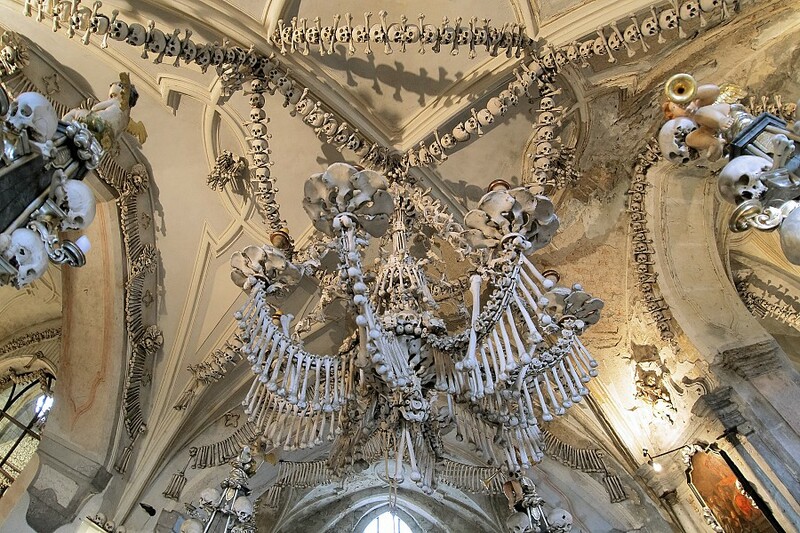 OK so I know I know my skeleton garland is FAR from being even CLOSE to decor in the Sedlec Ossuary, but I figured I could get closer to my vision by just getting a bag of bones and doing it myself! I drove to Target and picked up a bag of bones that happened to be on sale for $17! Pretty good and the bones are very realistic looking! I took my bones out of the bag and arranged them the way I wanted. Then I simply attached them to each other using a couple of nails and some picture hanging wire. 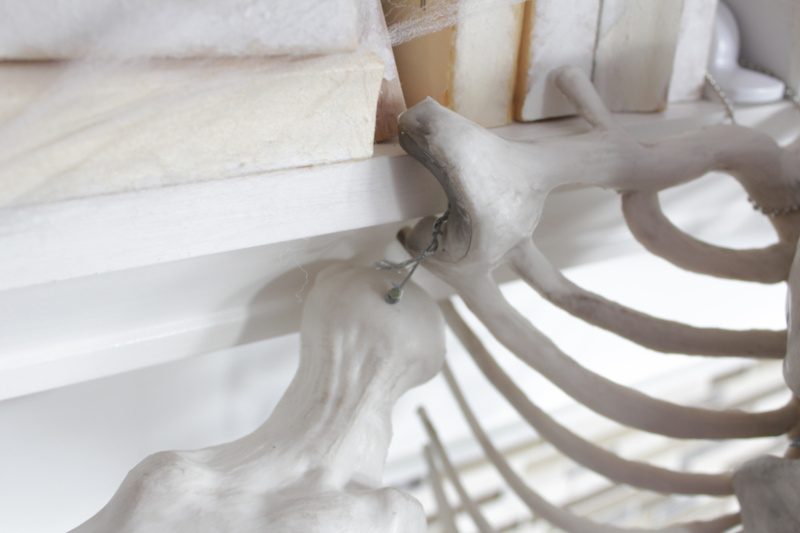 I only had to put a nail on a couple of bones since most of them already had holes in them. 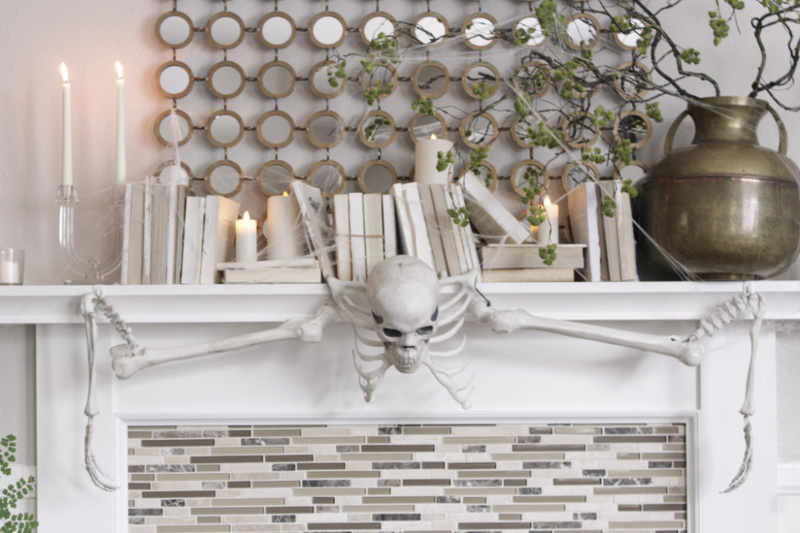 After the bones were attached to each other, I hung my skeleton garland to the mantel using command hooks. Love those strips! I use command strips to attach garland to my mantel all the time and it doesn't damage the wood at all! 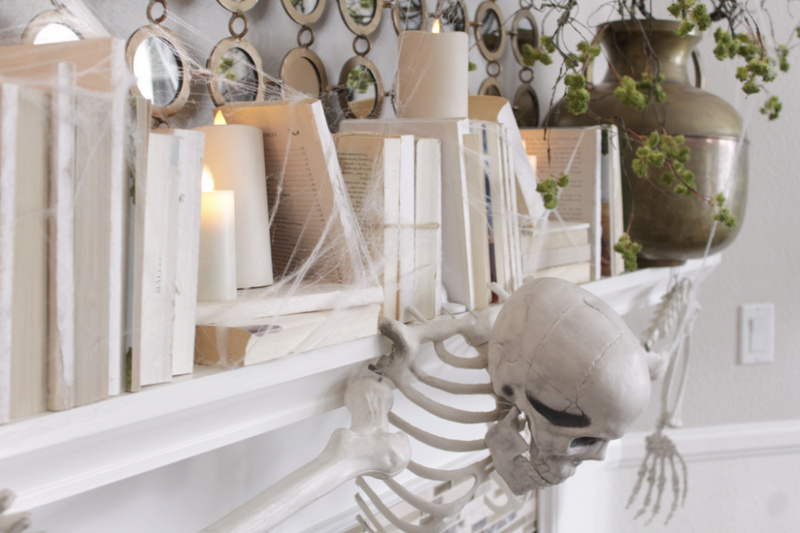 To finish off my Halloween Mantel, I added some old paperbacks and layered in some spider webs and battery-powered candles so I don't burn the place down. I really love how realistic these LED candles are! The flames actually flicker and move like the flame on a real candle! They also have a 5 hour timer so I have the LED candles set to turn on at sunset so I come home from work and walk into a candlelit living room, it's the coolest thing! 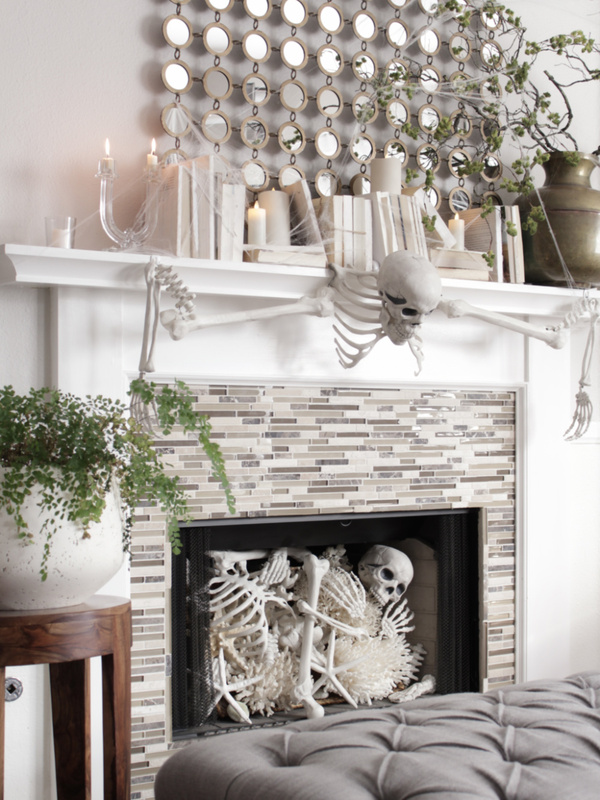 Oh, also I ended up buying two bags of bones but one was enough for my garland. 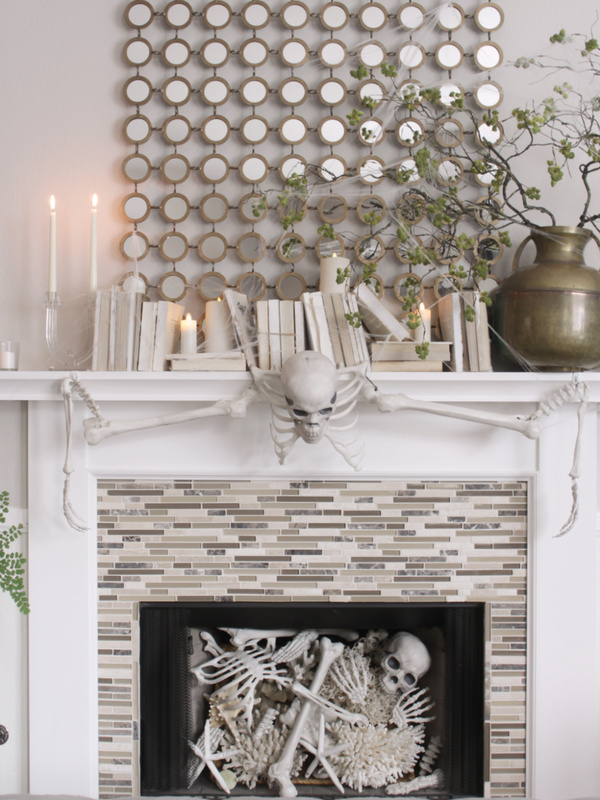 I almost returned the other one until my wife had the brilliant idea of throwing the extra bones inside the fireplace. I thought, they would look pretty awesome layered over the coral... and boy were we right! 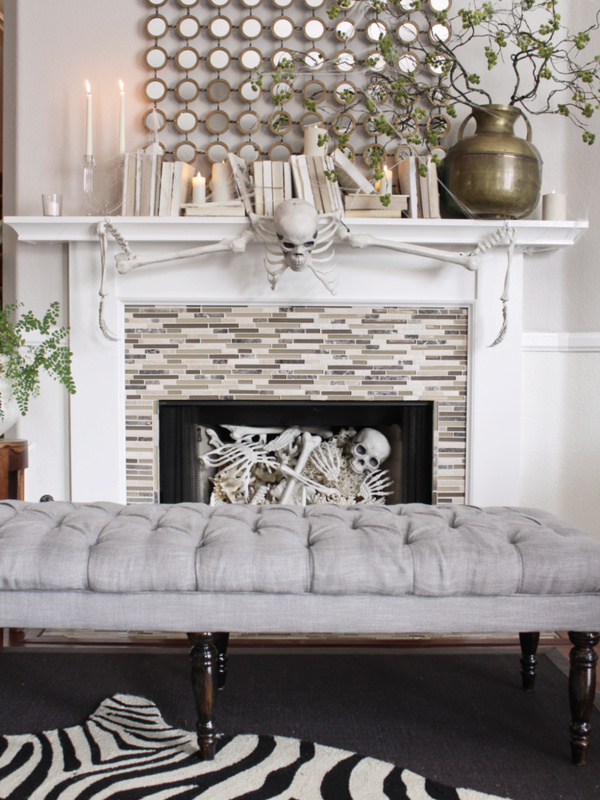 I know not a lot of people decorate for Halloween because it can get rather cheesy, but I find if you keep it simple, eliminate any gore and go for an upscale look by staying with a cohesive color palette then you can totally pull off Halloween decor in a cool, stylish way! 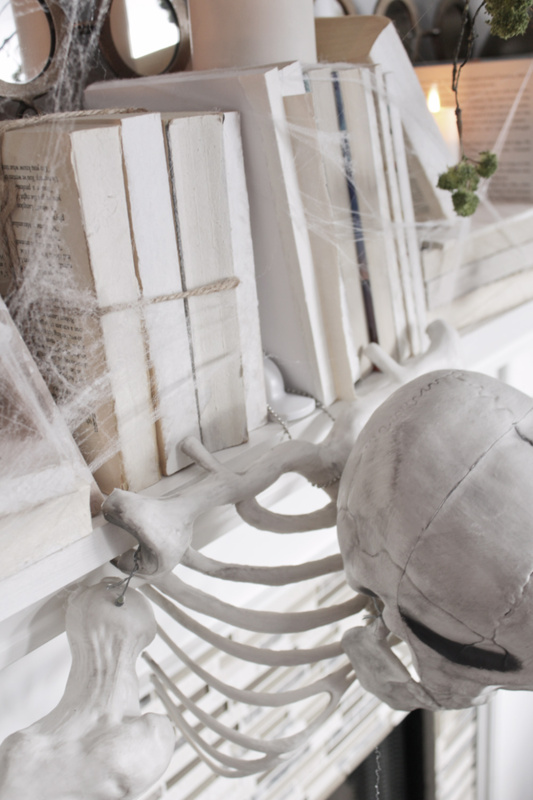 So far I like where my Halloween decor is going and I'm thinking of continuing this skeleton/catacomb/all white look in the rest of my home! 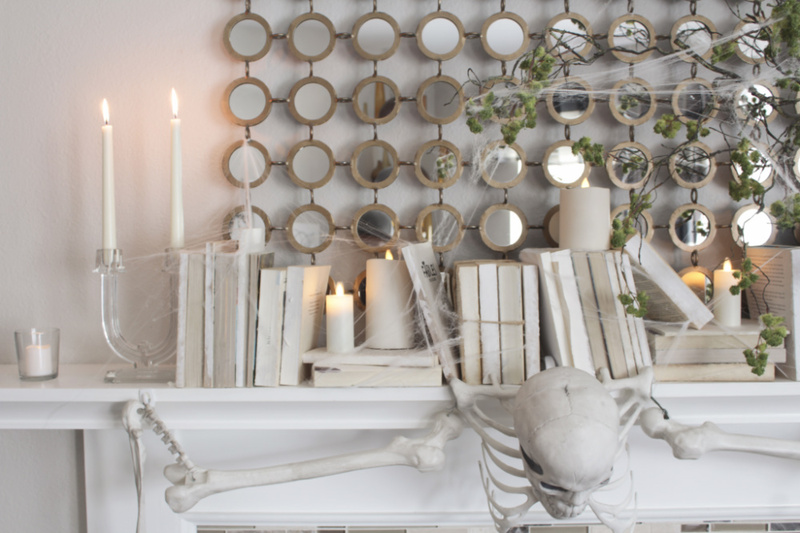 I'll be sharing my Halloween decorating progress along with some tips that include how to get your spiderwebs to look realistic cuz if there's one thing that gets to me, it's Halloween spiderwebs that end up looking like SNOW! I'm so glad it wasn't spiders! Lol sounds like we have arachnaphobia 🕷 I actually have decorated my front porch as a giant nest of spiders you have to walk thru.conplete with giant spider eggs! Thanks Brian! I love Halloween! I tell you what, your themed decor is *always* the best; love this one too!